Most modern HDMI connected devices support Consumer Electronics Control (CEC). It allows devices to send commands to each other, typically to get the TV to switch input and control volume. If you have ever turned on a Game Console and had your TV automatically change input to that device you have seen CEC in action. It is very convenient and useful, sort of a universal remote that works. Every manufacturer seems to have it’s own branding of CEC (e.g. Samsung Anynet+, LG SimpLink, Sharp Aquos Link) but it may need to be enabled. Check your manual for details. Using a Raspberry Pi connected to a TV that supports CEC, you can use the command line cec-client application to control the inputs and the TV itself. These are notes on how to use cec-client and understand the different options. This is part of a series on running a browser full screen on a Raspberry Pi at boot. 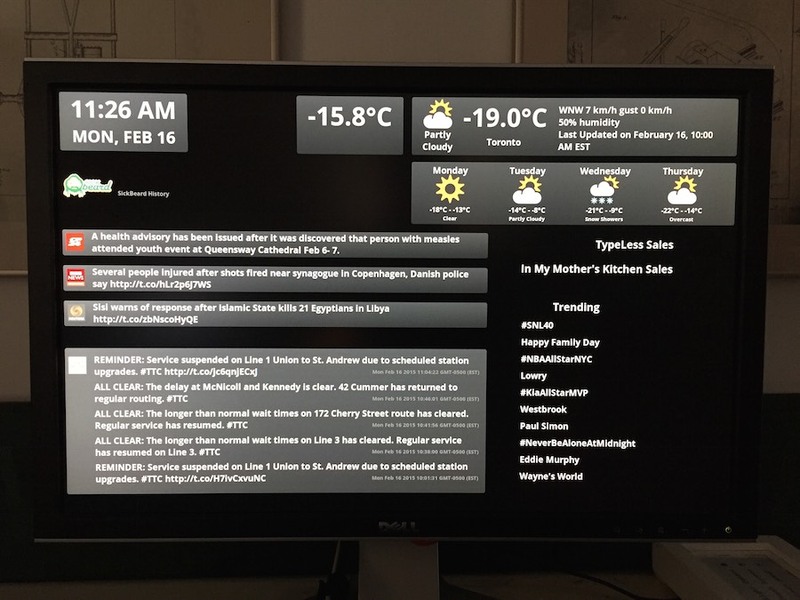 A few months ago I setup a web browser based dashboard running on a Raspberry Pi, displaying weather, time and transit information. It worked out well, but it’s success revealed another problem. Turning the screen on and off multiple times a day was getting old. So I did what any technically inclined person would do. I decided to create a device to turn the screen on and off by responding to dramatic changes in ambient light. The device would also provide a manual power toggle and button to refresh the browser. This is part 3 of 3 describing the final hardware that was built from the prototype. Although intended to be used with a Raspberry Pi, the screen controller can be used to emulate a USB keyboard and send any desired keystrokes. This is part 2 of 3, describing how to use an Arduino to build a USB keyboard emulator to call the hot keys. This is part 1 of 3, describing how to create a script to turn on and off the screen and hot keys to call this script. These are instructions to setup the Raspberry Pi to run the Chromium Browser in full screen kiosk mode. I recently picked up a Raspberry Pi from Creatron Inc with the intention of creating a dashboard. The following are instructions for installing Linux (Debian Wheezy) on the SD card from OS X Mountain Lion. I used the built in SD card reader on my Macbook Air and used several different SD cards, all 4 Gig or greater and all class 10. These instructions assume comfort with the command line.